Good Morning Everyone Happy Wednesday!! Its time for another fun Your Next Stamp Challenge. This weeks challenge is to Use lots of the color blue on your creation!! 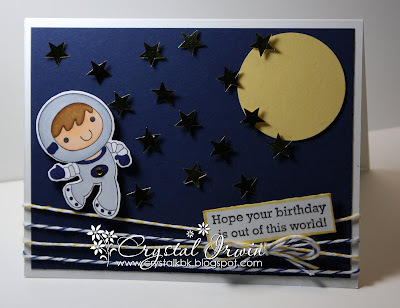 For my creation today I used this ADORABLE image Space Boy and the fun sentiment that comes in this set!! This set also comes with two darling aliens!!!! He is just sooo fun for those birthday cards!!! Hope you Enjoy!! I decided to create a scene for my cute space guy...heheh I used lots of blue for the night sky and added these fun stars and punched out a moon!!! We’d love to see you use a YNS stamp on your challenge card/creation, but if you don’t have one, then you can still join in and be entered into the prize draw (but please only enter one non-YNS creation per challenge). As our challenge runs for 2 whole weeks you have plenty of time to hop on over to the YNS Store and pick up some of these cuties yourself! And if you do use a YNS stamp on your challenge card/creation, you’ll be entered into the prize draw TWICE and be entered into the Top Pick draw – that’s 3 chances to win! Thanks so much for stopping by today, I hope everyone has a WONDERFUL Wednesday!!! This is darling Crystal!! I just love the background you created with the stars!! Amazingly cute!! You sure rocked this space boy!! Crystal, this is SO much fun!!!! Love it!!! Such a cute image and card! I love all the stars! Love the scene you created, those stars look fantastic!! Cute little space boy too!! So fun, my boys would love this! awww, this is so sweet Crystal!!! love the idea with the stars! fun & fabulous! 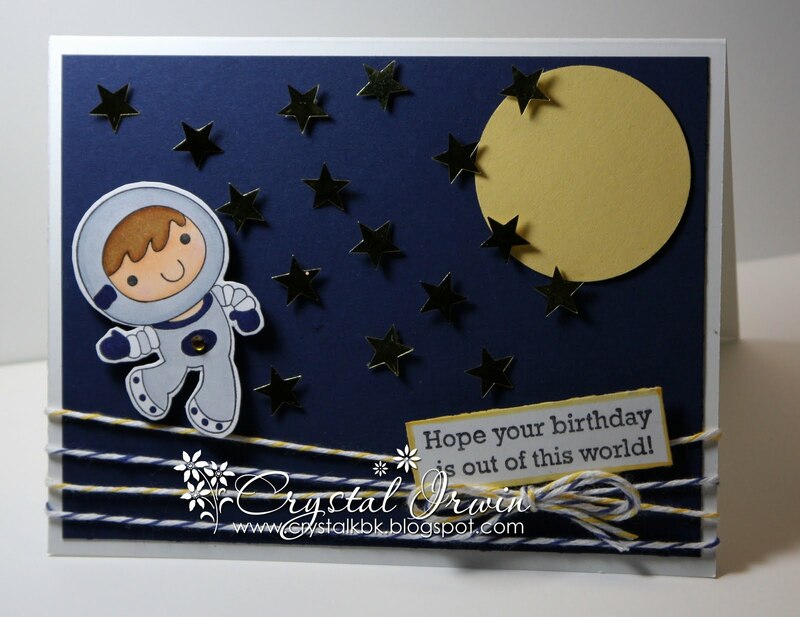 What a fun Boy card Crystal.. Love your twine and all the stars to wish from :).. and I wish for spring!! Way too cute, love all those stars! Oh Crystal your little space boy is sooo CUTE!! What a fun, fun image and I love the background! Oh he is just too cute girl!! What a great card, it's perfect for a boy! Super Adorable! I love the twine and the stars so much. I also just love how you colored him. Totally perfect for the Blue Challenge. Super duper CUTE...love that twine!! Such a neat use for it. The stars look pretty nifty too, all popped up. This is adorable Crystal! What a sweet little scene you have created. This is so adorable, Crystal! I love all the stars and fab twine treatment! CUTE!!! OH my goodness...This is the most adorable card ever! Love all the starts and your sweet layout. Simply Fabulous. Your card is just gorgeous Crystal! I love that color combo myself ;) Beautiful work!! Hope your weekend will be fab!